Gr 4-6 –Ashley Bryan takes readers back to the brutal reality of American slavery, using primary source documents from an 1828 estate appraisal as his launching point to bring the 11 enslaved people listed to life. Freedom Over Me: Eleven Slaves, Their Lives and Dreams Brought To Life. 44 min. Dreamscape. 2017. $38.99. ISBN 818520079714. 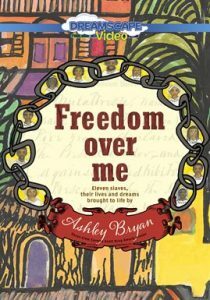 Gr 4-6 –Ashley Bryan takes readers back to the brutal reality of American slavery, using primary source documents from an 1828 estate appraisal as his launching point to bring the 11 enslaved people listed to life. To each he has given a specialty—seamstress, basket weaver, cook, carpenter, etc.—and fleshed out their background and cultural heritage, offering a first-person voice through his poetic narrative. The illustrations, lined like fine wood and textured mahogany, depict in simple animation their stories and express their dreams. The daily reality of enslavement, along with each character’s memories and pride in their specific African culture, are woven into the tapestry of this work; the relationships between the enslaved people are also emphasized. This makes the fact that they are to be sold and separated all the more heartrending. Different narrators voice the characters, expressing words of pain and, ultimately, hope. The author’s note adds additional insights that are valuable for increased depth of understanding with regards to his intentions and his source material. VERDICT This is an exceptional work that merits a place in all collections.–Teresa Bateman, Brigadoon Elementary School, Federal Way, WA This review was published in the School Library Journal November 2017 issue.